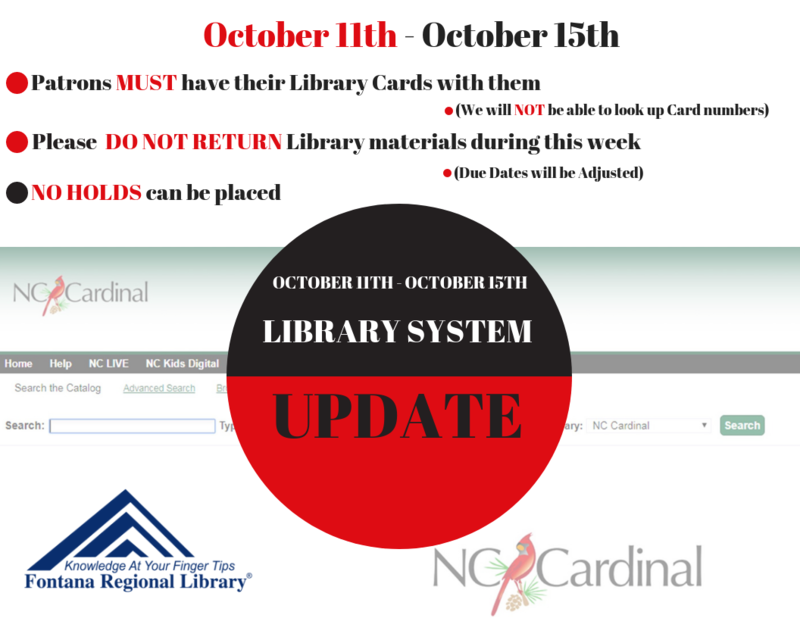 From Thursday, October 11 through Monday, October 15, the NC Cardinal library catalog (shared by Fontana Regional Library and more than 160 libraries across the state) will undergo necessary maintenance and upgrading. During that time, the online catalog will not be fully available either to patrons or to library staff. Fontana Regional Library patrons will need to have their library cards with them in order to check out materials during the catalog upgrade period. From October 11 to October 15, library staff will NOT be able to look up patrons by name or issue new cards. In addition, no holds can be placed or processed, and books cannot be checked back in for re-shelving. Due dates will be adjusted to skip those days, and no fines for overdues will be charged during that period. The library is asking patrons to make their returns either before October 11 or after October 15 because storage space is limited. Libraries will remain open their usual hours during this transition period, and staff will be on hand as always to assist patrons in checking out items. eResources including eBooks and eAudiobooks will remain available throughout the transition period and are a convenient way to keep reading and avoid delays. For more information, please contact your local Fontana Regional Library location.